ALLEGRA BOVERMAN/Staff photo. Gloucester Daily Times. 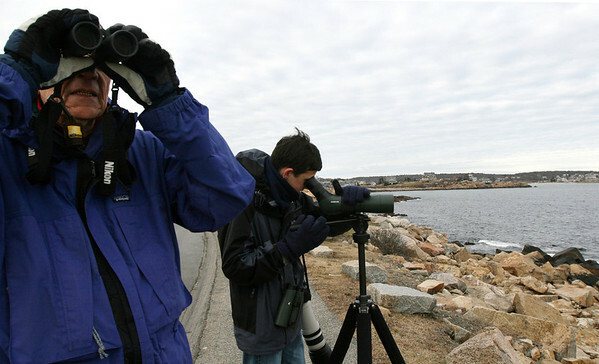 Gloucester: Avid birders James Orrico, left, and his grandson Alex Burdo, both of Fairfield, Conn., were looking for unusual birds in Cape Ann and other areas nearby on Wednesday. While in Gloucester along Atlantic Road, they saw a male king eider, which, according to them, is rarely seen except very occasionally in the Gloucester area. They also saw a Townsend's warbler in Ipswich and other birds such as white-winged scoters, red -necked grebes and common goldeneyes. They participate in bird counts via ebird.com, part of the Cornell Lab of Ornithology. They travel together all over the country looking for birds.